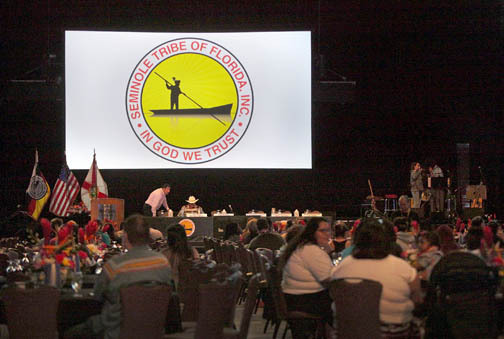 Profit Reigns at Annual Shareholders Meeting | Seminole Tribe of Florida, Inc.
Tribal citizens gather Jan. 9 at the Hard Rock Live concert arena turned conference hall for the Tribe’s annual shareholders meeting. “Just give me a Cypress hole and a tree for shade … to me, that’s as close to heaven as a man can get … I got a few good friends, all my bills are paid, I got the moon and stars, I got it made,” sung the Rev. Paul Buster. Board President Mitchell Cypress opened the meeting with a brief address in Mikasuki and English. “It’s good for us to take time to come out, get some reports from new and old products and services, and find out what we need to do to continue doing well and make improvements,” President Cypress said. New employee announcements included Joel Frank Sr. as the Board’s chief operating officer (COO). Frank served the Tribe most recently as director of government relations and initiatives. Others in new employee positions include Carlene Osceola as executive assistant to President Cypress, Sue Jane Cypress as executive assistant to Council Vice President Cypress and Peggie Reynolds as assistant to COO Frank. Diana Betancourt is the Board’s new office manager. Mike Ulizio, the Board’s chief financial officer, provided a brief overview of Seminole products from wine and water to petroleum. Ulizio said the Tribe’s businesses experienced “rapid growth” in 2015 through diversification of consumer services and products. Services and products include Intermezzo Wines, Jani-King janitorial franchise, OWV natural spring water, the Brighton RV Resort, Seminole Board Construction, Hard Rock Energy drink and Askar Energy fuel distributors. Most successful were: Hard Rock Energy drinks now selling at 600 7-Eleven stores in Texas; and the Tribe’s cattle business, which has soared in recent years to become the second largest Brangus seed stock operation in the United States. Ulizio credited the cattle business as a prime example for continued success in consumer product sales: the Tribe’s legacy stock, born and raised on Florida land, and the Tribe’s 4,500-acre Salacoa Valley Farms in Georgia boasts top Brangus stock. “Long ago the Salacoa bulls were ones we looked at but could never buy. Now the Tribe owns the entire herd,” Ulizio said. Other businesses also showed positive results in 2015. The Bōl restaurant at Seminole Hard Rock Hotel & Casino Hollywood was noted for earning $3.5 million in revenue last year. Hollywood Board Rep. Steve Osceola said the Tribe will add another location later this year at Seminole Casino Coconut Creek. The Brighton RV Resort has doubled in revenue since 2013. The campground boasts four new family-sized cabins; 56 renovated campsites with water, electric and sewer; a salon and day spa; swimming pool; recreation room; and wheelchair accessible bath house. Though the annual shareholder recap was significantly positive, business leaders are not resting on achievement. Reviews of business strategies and results revealed needed improvements in marketing. Currently, websites and social media campaigns are in flux. Alex Johns, natural resource director and head of the cattle business, said Tribal citizens and others with interest in the Tribe’s success can help. “Tweet, Instagram, Facebook, Pinterest … some of the fastest ways to generate interest and business profit is to get word out. The more buzz, the more business, the higher premiums,” Johns said.